Does your dog love to wring the life out of one of his or her favorite toys? 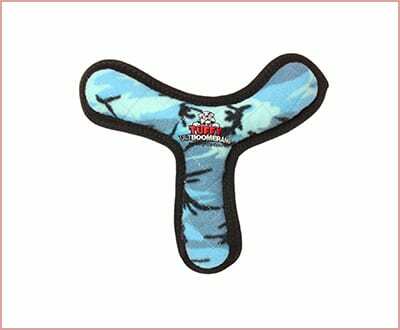 In fact, Tuffy dog toys are widely considered to be some of the toughest in the industry. The line also has a wide variety of options for your pet. There are some that are shaped like bones, others that have no stuffing, and many that are animal-shaped. The Tuffy brand really gives you a lot of great options for your best friend. 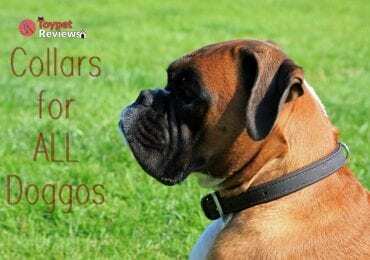 In this guide, we’re going to take a look at some of the best Tuffy dog toys based on customer reviews, to help you with your search. What bow-wow doesn’t like getting a bit rough, and tumble with their favorite dinosaur? The Tuffy Dinosaur dog toy is one of the best Tuffy dog toys for dogs that really like to bite deep. It has four layers of material so that it can take a few chomps. If your pet likes to go on adventures, you’ll be pleased to know that this line of dinosaur toys will float on water. Despite the fact that it’s tough, this dinosaur toy line is made of soft fleece that is cross-stitched to last longer. Some of the seams are a bit vulnerable. Dogs always love a good bone, and this version of the Tuffy dog toys bone is designed to last and withstand the bites of dogs that are a bit larger. The middle of the bone is about two inches, so most dogs should be able to comfortably bite down on it. Like other Tuffy toys, this bone is well-constructed with several layers of material so that it will last for years of rough and tumble chewing. For extra doggie engagement, the bone has securely inset squeakers. Smaller dogs will have trouble getting their teeth around the middle. Sometimes, you want a toy for your pup that doesn’t have a lot of stuffing. In this situation, the Tuffy No Stuff line of dog toys comes in handy. This particular toy comes in a ring shape so that you can spend hours playing tug of war with your pup. This is also a good design for a couple of dogs to play with simultaneously. This ring floats in water, so if your dog likes to go for a swim from time to time, this may be their favorite pool toy. The squeakers can be chewed out. For those pet owners looking for a little fantasy for their dogs, this Tuffy Dragon might be a perfect way to play with your best friend. The dragon doesn’t have a squeaker in it. However, the wavy design will surely engage your pet. 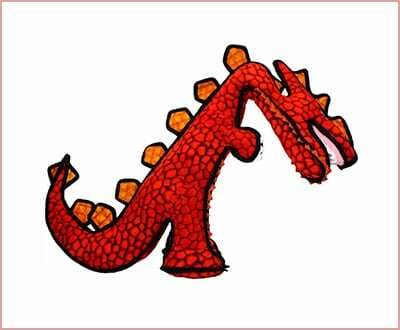 This dragon is very durable; even bigger dogs will have trouble damaging it, even after months of play. 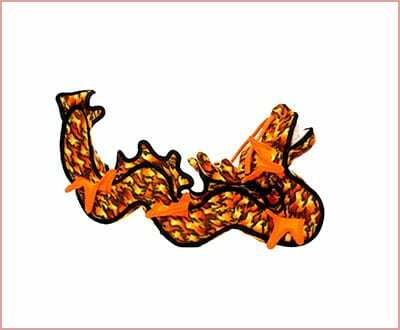 The dragon toy comes in both yellow and orange color options. It’s a bit large, which means that it can get in the way. There’s nothing more entertaining that having a nice tug of war with your favorite canine. They love it, it’s great exercise, and it strengthens your bond. 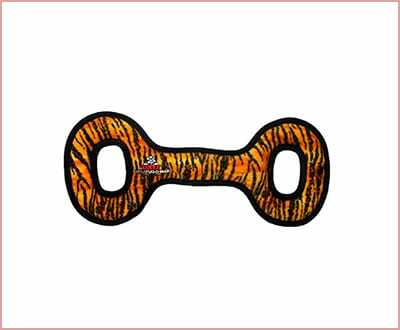 This Tug Oval is one of the best tuffy dog toys for an occasional tug of war; simply grab the end of the loop, and your dog will know how to do the rest. 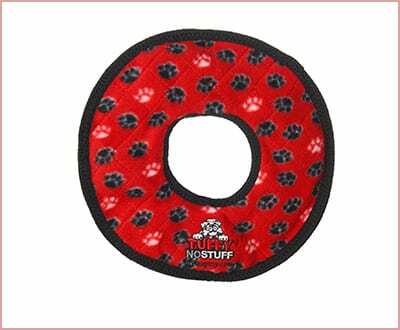 The Tug Oval has squeakers that are firmly sewn inside the ultra-durable material that Tuffy uses to make their toys dog-proof. Have two dogs? Then they can play tug of war among themselves. It’s easy to grip by humans. This toy is all about play, but its larger hoops are best suited for larger canines. For a slight change up, this is one of the few Tuffy dog toys that isn’t made of their tough fabrics; in fact, this toy is fully made of rubber. This pet toy is best used by dogs that are larger; at least 15 pounds or so. This is a great fetch toy because it has a rope “fuse” that your canine can lock his or her jaws onto. 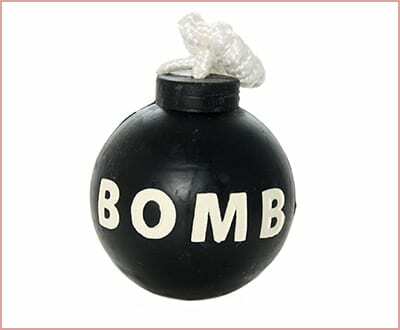 For the largest breeds, there shouldn’t be too much of an issue grasping onto the 3x3x3 body of this bomb. 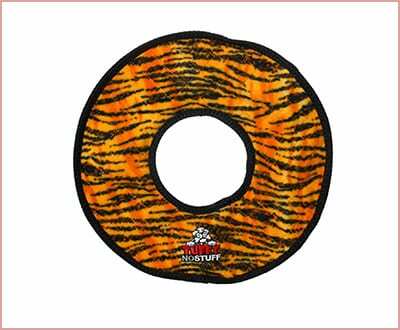 Another No Stuff Tuffy toy, the Mega Ring is one of the best tuffy dog toys for bigger dogs, as it is fairly large and shaped like a thick ring. This is a great Rottweiler toy because it really engages them, and they can even use it for tug of war matches with you or their pack mates. Tuffy has included squeakers that are securely sewn into the four-layer fabric of the toy. 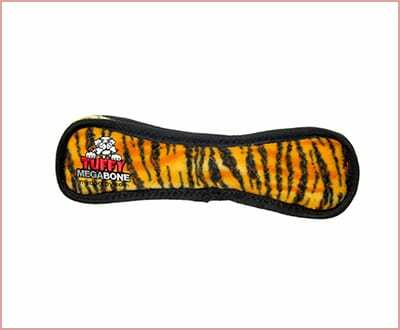 This toy has a tiger-striped pattern that your canine friend will love. It has a tiger-striped design. It’s not great for medium and small dogs. While the Bowmerang won’t come back to you by itself when you throw it, your furry buddy will ensure that it gets safely back into your hands. As a great fetching tool, the Bowmerang is durable and can take more than a few bites from your dog. This is one of the best Tuffy dog toys for larger breeds; your dog should be at least 20 pounds or so to play with this toy. It has a cool light blue camouflage color that stands out when you throw it. Some dogs may actually be able to damage it. Tuffy dog toys are made extra tough and come in enough varieties to entertain just about any dog. Each of the products that we’ve covered in the article will help keep your pet happy and engaged. Your furry friends will foster a stronger relationship with their toys, so you might also like our reviews of the indestructible dog toys. If you have any questions about the Tuffy line, share them with us in a comment!